Andrey Bougreenov is a bright representative of St. Petersburg piano school. He is a professor of St. Petersburg concervatory, a lauriate of prestigious European competitions. No doubt it is his expressive technical skills, subtle nonstandart thinking in presenting a musical tissue, fascination of his generouse Russian nature that make his performances realy popular. Andrey Bougreenov was born in 1964 in Voronezh. He has got his first musical education there. In 1991 he graduated from St. Petersburg concervatory from professor Lebedev's class and has got Ph.D. degree in 1993. He won the 1st prize in Boltszano (Italy) in 1991. At present he toures much both in Russia and abroad (Germany, Italy, South Africa, USA). He performes with the best Russian Symphony Orchestras and conductors like Temirkanov and Gergiev. The pianist's favorite composers are Rachmaninov and Prokofiev. In his repertoire there are the best Russian and Europian piano compositions. 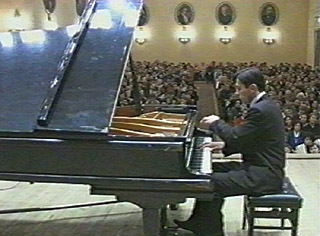 Andrey Bougreenov regularly performes with St. Petersburg Symphony Orchestra as a soloist of international competition of symphony conductors named after Sergey Prokofiev.